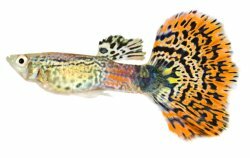 These fish come in every colour possible and they are now available in a range of different tail types including veil-tail and scissortail. They are lively aquarium fish which add a lot of movement to an aquarium, which is one of the reasons I still keep them today. They are also peaceful and non aggressive. Due to their long tails they are likely to be picked on by fin-nippers such as Tiger Barbs. It is also not a good idea to keep them with aggressive Cichlids such as Angelfish and Oscars, as they probably end up being eaten. I keep mine in heavily planted aquarium with large bits of bog wood and rock. Aim for a temperature of between 21 and 25C and pH of around 7.5. The term millions fish refers to how easy this fish is to breed and given the right circumstances they will multiple into a large number in a short space of time. 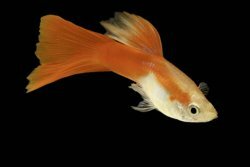 They are livebearer fish which means they give birth to live young otherwise known as fry. It is very easy to tell males and females apart. Males have long colourful trails and thin bodies. Females are much less colourful then the males, they also have short tails and round bodies. If you going to keep males and females together you need to keep at least 3 females to every male, this is because the males spend all their time chasing the females around trying to mate with them. If you just have one of each gender the female will eventually get tired and die. When female fish are pregnant their bellies become much darker and bigger as they get ready to give birth. They can give birth to up to 40 fry, although when I have counted it’s normally been around 20 fry each time. 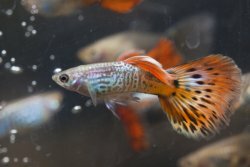 Some people advise you place pregnant guppies in what is known as a breeding trap, which is a small plastic container with compartments designed to keep mother away from the fry after they have been born. It can be hard to predict when the female is going to give birth. The use of breeding traps can also stress the female. They don’t like being removed from their normal environment and then kept in small container. A well planted aquarium with rocks and wood should provide hiding places for both mother and fry to be safe from other fish. If you wish to keep the pregnant female away from other fish setting up a small separate tank would be a good idea. 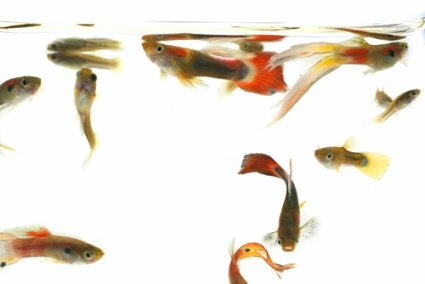 With the growth of the nano aquarium industry you can buy excellent tiny aquariums, some as small as 8 litres which would be ideal for raising guppy fry.